Retain top employees while communicating company values. More affordable than other vendors. Ask us how! We have a customer ethos to “surprise and delight” and we encourage colleagues to tell stories... how they surprised and delighted customers... we wanted to create a recognition scheme around this... Hence Recognize. We have a strategic plan in place to track all the recognitions, showcase our company culture, and reward our employees. We’ve sent out surveys to get feedback on Recognize and have received wonderful comments from remote and satellite office employees feeling more connected and overall the entire team feels more inspired. A look back what we learned in 2018 and what is the future of corporate employee recognition. Turnkey employee recognition app for Outlook, SSO, Slack, & Office 365. Companies around the globe use Recognize as their social employee recognition app, manager-to-employee recognition app, employee rewards, and employee anniversaries. In the high stress world of hospitals and clinics, Recognize is deployed to lighten the mood and strengthen morale. Further, to promote safety and increase customer service. The kiosk mode is very popular with medical groups because staff can see the recognitions as they walk the halls. Banks love the fact they can promote great customer service. Banks are using it to gather people analytics each month to promote individuals who do great work across categories. Non-profits and government agencies use recognize to let their staff know they are appreciated. Recognize enables any organization promote what is important to them, because Recognize is a platform to be shaped to your company. Non-profits and educational institutes, ask about the discount! Not all R&R programs require rewards. Simple non-monetary thanks, fist bump, high five are sometimes all it takes. Plus, Recognize can serve any organization no matter the size or department. Finance is long hours and often tedious tasks. They deserve recognition for attention to detail and successful quarters. For international offices, companies are utilizing the company-fulfilled rewards to provide a special thanks for employees no matter where they are. Universities are big on employee recognition and awards, but typically more on the traditional side of recognition. University of Sydney is more forward thinking and uses Recognize for weekly endorsements. Let's face it, insurance has high turnover. Not true for innovative companies like WEA Trust. They have a buzzing company culture thanks to programs like Recognize. Credit unions are using Recognize to promote fraud detection amongst its staff. Instant notification always feels great for doing good work. Plus, leaders can discover who was the top fraud detector across time period and branches. Much like hospitals, clinics need to find ways to connect with its peers and strengthen morale through stressful periods. An employee recognition program with best-in-class tools & integrations. We offer many types of employee rewards including the best brand gift cards, cash cards, nonprofits, and company-fulfilled system. Staff can redeem with points at no additional cost. When employee rewards really show the company cares, you will retain and engage staff. Recognize makes it easy to send and receive official positive feedback for any custom role in your company. Create recognition badges only for certain people, such as managers or executives. Direct report managers have access to a dashboard about their employees. Recognize is the best employee recognition program for Office 365. You can use the entire Recognize platform inside Sharepoint or inside Yammer, and more. Use Recognize's employee engagement strategy within your workflow. If your company has Office 365, SSO (such as Okta), Yammer, or Google accounts for your staff, they can login to Recognize automatically. Staff can send and receive official employee recognition from Slack. Users do not need to login to start using it. Just have the admin install it as a bot for your company's Slack account. 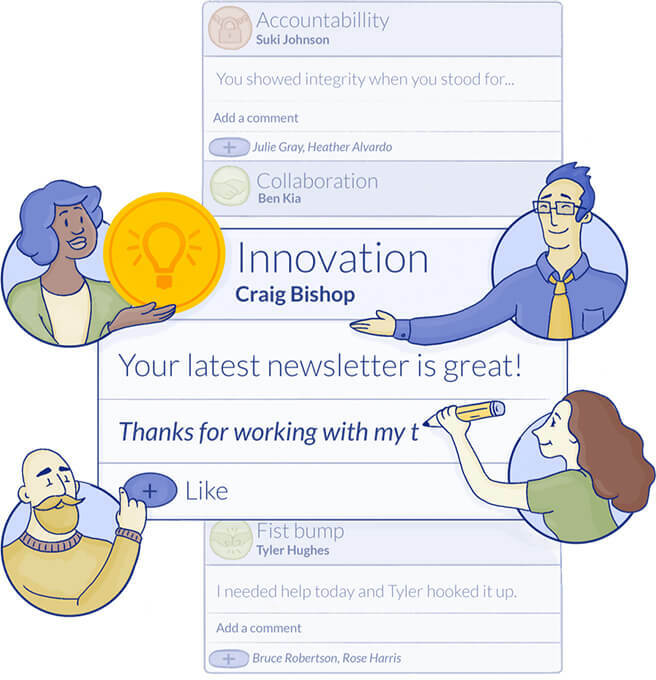 Send recognition where everyone already works: Outlook. View your company's employee recognitions, redeem employee rewards, and see your profile all within Outlook 2013 and newer. Create a personalized gamification strategy with badges, leaderboards, points, and more. You can use one of 30 well-designed badges and change the characteristics of those employee recognition badges. You can also upload your own badges in just a couple of clicks. You can change the points associated with a badge or choose who can send a badge. Recognize supports the popular Azure Active Directory, Yammer sync, and SAML for single sign on for your staff. This is the way to manage users in your company. Recognize can import user spreadsheet, Yammer user data, Slack user data, and Office 365 user data. Customize the corporate recognition leaderboards to focus on the employee, teams, or overall throughout your company. The staff leaderboards include filtering by badge or by time. When a recognition is created, you can print off an employee award certificate that represents that recognition. Certificates can be customized. Recognize provides mobile-ready employee recognition. Staff and recognition admins can login to the mobile website, Android and iPhone employee recognition apps. Staff can receive recognition through SMS text message. We help companies set up text message recognition for your entire staff. Your employees won't need to be an existing user. Only Recognize offers a visual representation of the top employees across badges or teams in your company employee recognition program. View top employees in any time dimension. Companies signed up for Recognize can enable this feature in their admin settings. Build stronger, happier staff through monthly check-in meetings with Recognize team members. When you sign up for Recognize you also schedule strategy meetings on a monthly basis. Join the hundreds of companies who know what's best for their staff and their bottom line. These employee recognition-focused organizations who stand for positivity and company culture. People drive your company. Do what is best for them and profits will follow. Recognize is an employee recognition & staff rewards program. Recognize team are inventors, technologists, & psychologists dedicated to building the best employee recognition app in the marketplace. That's why the Recognize employee recognition & rewards program is inside Workplace by Facebook, Outlook, Sharepoint, and other apps your staff use on a daily basis.